The Dispensary Notebooks for Neurological Disorders were transferred from the Perelman School of Medicine, Department of Neurology to the University Archives in February 2017 (Accession No. 2017:05). The Dispensary Notebooks are organized into three series: Dispensary Notebooks, Case Study Notebooks, and William G. Spiller Reprints. The Dispensary Notebooks and Reprints series are arranged chronologically, while the Case Study Notebooks Series is arranged by the book letter. 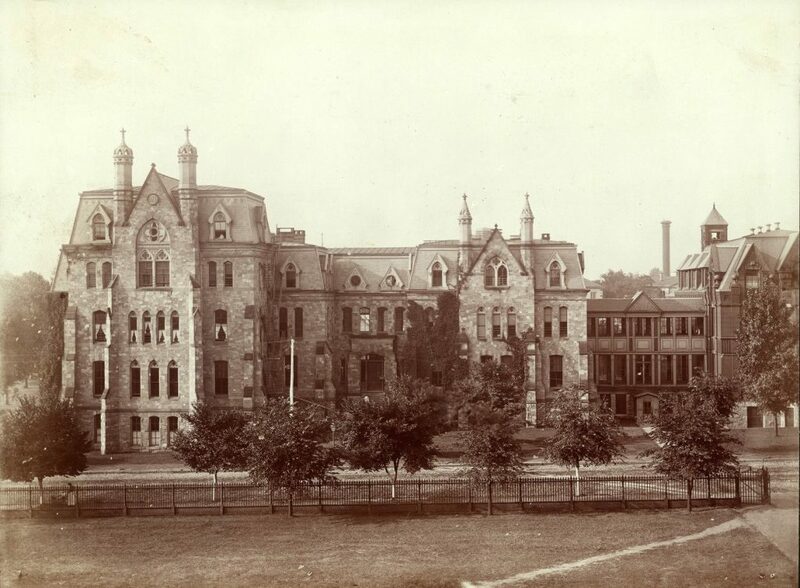 When the Hospital of the University of Pennsylvania opened in 1875, the Dispensary for Nervous Diseases was one of seven dispensaries at the Hospital. Located in the basement, the dispensaries provided clinical care for patients who were not sick enough to be admitted to the hospital, or were unwilling to be admitted. The Dispensary was open every day but Sunday and holidays, with the neurological dispensary starting at 12:30. Dr. Charles Karsner Mills (M1869, PhD 1871) was appointed the first Chief of the Dispensary for Nervous Diseases, reporting to Dr. Horatio C. Wood, Jr. (M1862) who oversaw all neurological cases at the Hospital as Clinical Lecturer of Nervous Diseases on the Medical Staff. In the first year of operation, the Dispensary handled 282 nervous diseases; by 1889 that number would grow to 449. In that fifteen year period, the Dispensary handled on average 377 neurological cases. To meet the growing demand of the Dispensary assistants were added – including George J. Clunas (M1877), William B. Christine (M1877), Dowling Benjamin (M1877), James H. Lloyd (M1878), Isaac Pearson Willits (M1880), and Charles S. Potts (M1885). In 1883 Francis Xavier Dercum (M1877) was appointed Chief of the Dispensary for Nervous Diseases, also becoming assistant neurologist to the Medical Staff the following year. The Dispensary Notebooks for Neurological Disorders consists of three sets of volumes arranged into three series. The first series, Dispensary Notebooks, contains the daily log of neurological cases treated in the Hospital of the University of Pennsylvania’s Dispensary. Each notebook contains an index of patients, followed by pages detailing the diagnosis, patient information, symptoms given by the patient, and and treatment along with any follow up visits. The second series, Case Study Notebooks, contains information based on patient treatment grouped by specific diagnosis. The majority of notebooks were numbered on the outside at some point in the late twentieth century, which is reflected in the numbering system. A few of the dispensary notebooks were numbered during their creation. At the time of acquisition it was unknown why the numbering was out of sequence or if additional notebooks existed at some point. The third series, William G. Spiller Reprints, includes two compilations of papers authored by William G. Spiller during his career and a publication of papers by physicians including Spiller associated with the William Pepper Laboratory. Dr. William G. Spiller (M1892) was a noted clinical neurologist and professor of neurology at the University of Pennsylvania School of Medicine during the early twentieth century. The Spiller Reprints came with the Dispensary Notebooks from the Department of Neurology. Dr. Spiller was not associated with the Dispensary during the period covered by the notebooks.